The Supreme Court hearings on the Defense of Marriage Act (DoMA) in Washington this week, and the related polls about how public opinion is changing around the rights of gay and lesbian couples got me thinking. What role might artists and art educators have played in this shift? While many contemporary art educators think Keith Haring is passé, he and his work were ground breaking in the 1980s when I was a kid. I grew up in the New York metro area with some relatively progressive teachers, at least one of whom was gay (though I didn’t know it at the time). Though I can’t recall the particular curricular context, one of those people taught me about Haring. I remember being fascinated by his process of drawing on blank subway ad space and by his fresh style. I remember learning that he was gay and that his work addressed HIV/AIDS. I passed his Crack is Wack mural, on the way to my grandparents’ house and browsed the shelves of his Pop Shop in SoHo on the weekends with friends. I am sure that he was one of the first gay men I was aware of. Madonna also played a role in my burgeoning adolescent awareness of varieties of sexual orientation. Rumors of her love life were fodder for schoolyard debate and my friends and I devoured her videos on MTV after school. Her videos broke boundaries. (If its been awhile since you watched “Material Girl,” “Express Yourself,” or “Like a Prayer,” do yourself a favor and click on one of these links. Seriously. Then, if you’ve never indulged in anything Camille Paglia wrote about Madonna, you might try this little piece from the NYTimes.) Kids today take Madonna’s influence for granted. But the pop stars they adore haven’t forgotten. That’s why all the girls, Brittany, Niki, and Christina, want to make out with her any chance they can get. It’s hard to say what impact any one influence makes on the development of a cultural value as deep as recognizing that people should have a right to marry whomever they choose, regardless of gender, race, ethnicity, or socioeconomics. I know that I had countless other introductions to homosexuality and the struggles gays and lesbians face over the course of my upbringing. In Hebrew school we learned that homosexuals were tortured by the Nazis alongside our families. My aunt’s best friend was a tremendous queen with a fabulous sense of design and humor to match. He died under her care, from AIDS, when I was in college. What I can say with great certainty is that teachers, and the content and manner in which they choose to teach, influence people’s world views. Sometimes this requires direct intervention like including gay and lesbian innovators in the pantheon of one’s field. At other times it can be more subtle, like not tolerating hate speech overheard in the hallway. Too often I find art educators hesitate to address homosexuality in their classrooms, even as they teach about openly gay artists, some of whose artwork is strongly influenced by their sexual identity and issues surrounding it. When I encounter them, I like to challenge those teachers to name the risks in doing so, and ask themselves if they might not be censoring themselves. As young people’s support for expanding the definition of marriage to include a man and woman, two women, or two men suggests, it does get better. And artists and art educators are helping blaze the trail to the other side of that rainbow. In the moment I wasn’t trying to teach her any specific lessons about nutrition or marketing, though that will certainly come later. But I definitiely didn’t want her to get excited about that guy. I was satisfied when she voiced agreement, “Yeah mom. That boy is scary.” I could tell she was just parroting me, but I didn’t care. I suppose I was channeling my inner Morgan Spurlock who, in Super Size Me (2004), suggested that he would punch his kids in the face whenever they drove by a fast food place. He was being sarcastic, of course, but I fully support his call for counter-balancing the efforts of food giants to occupy our children’s lunch boxes. Spurlock’s comment was part of a conversation with a friend on research conducted by big tobacco that showed young smokers were likely to buy the same brand of cigarettes their parents smoked. Apparently, even stinky cancer sticks can serve as a Pavlovian conditioning tool, producing warm and fuzzy childhood memories. In this light, Spurlock’s entire film can be seen as a revolt against happy meals. I found it very effective as such when I showed it to Goerge and Rosa a few years ago. Sometimes the truth can really give you a belly ache. I reluctantly drove past Ronald again to snap the photo above. It was then that Cora told me she liked the way the boy was waving to her as his arm blew in the breeze. For her, seeing that brightly colored giant smiling down from on top of the building was really just a cool visual experience. An example of how interventions in the landscape – whether created for the purpose of fine art or advertising, can make the familiar strange. This was not something she sees everyday. I parked the car for a minute, and allowed myself to be momentarily mesmerized as Ronald waved hello to me too. My colleagues and I often talk to advisees about not making assumptions about student perceptions. There is much to be gained by asking kids why images appeal to them and then following up with questions that encourage them to critically examine those preferences. I’m not going to go so far as to thank McDonald’s for providing me and Cora this opportunity, I would still prefer that she grow up in a landscape absent of advertisements. But for now, I’m trying to look beyond the lines I’ve drawn around my own thoughts to the bright side of this scenario. One of my first posts on this blog was about the opportunity Cora has provided for me to engage with picturebooks again. My first encounter with picturebooks as an adult was through the wife of an M.F.A. classmate of my ex-husband. She was a children’s librarian and seemed to spend all her pocket money on picturebooks. She had, what seemed to me at the time, a massive collection. She spoke of them with the same passion as her husband reserved for the Dutch masters. When I was teaching high school, and an alumna came to speak to the advanced classes about her college experiences studying Illustration at MassArt or some other place in Boston. Her goal, as I recall, was to illustrate picturebooks. I was intrigued by the quality of her work and the creativity of the challenges her professors assigned. It was very different than the liberal arts-oriented fine arts program where I was a student, more career-oreinted. Suddenly, I saw illustrations everywhere, – not only in picturebooks but in print ads, on book covers, and on products at the market – and I became much more attuned to things I could consider as I looked at them. I encountered Illustration again when, as I also wrote about in November, I had the pleasure of meeting Ken & Sylvia Marantz, the godparents of so many who look at picturebooks as portable, multimodal, (intellectually) provocative works of art. They taught be how to look at and speak about picturebooks in new ways, to new audiences. It was around that same time that I met my step-children. George had just turned six and started kindergarten, Rosa, was about to turn four. I helped them get their first library cards and loved to take them to pick out stacks of books. Often we’d hunt and gather around a theme like pizza, planting a garden, or cats. That was always fun because we got a sense of how lots of authors and illustrators approached the same topic. This is all a very long-winded introduction to establishing Picturebooks on the Potty as a regular column. (I won’t commit to its regularity at this time, but I promise it will be at least once a year. Really, I’m planning for about once a month.) I hope the column will appeal to thinking people as a whole, not just parents and art educators who might already appreciate the artistic and cultural value of picturebooks. I want to inspire folks to read a picturebook any chance they get, and to allow themselves to engage with the story and the pictures as a total experience. To get started, I offer this trailer for 13 Words (2010), by Lemony Snicket and Maira Kalman. Readers of The New Yorker and The New York Times should recognize Kalman’s work. Her style is approachable because it is based on contemporary observation, reflecting the world we see everyday. It is bright, painterly, and playful. Lemony Snicket is known for his books for kids who don’t expect all their stories to end with “…and they lived happily ever after.” I can’t find the backstory on how they put 13 Words together – how they chose the words, whether they conceived of the story together. If anyone knows, please share! Tonight Rosa was reading 13 Words at dinner. (Internal dialogue: She and George are also grateful to have picturebooks in the house again. 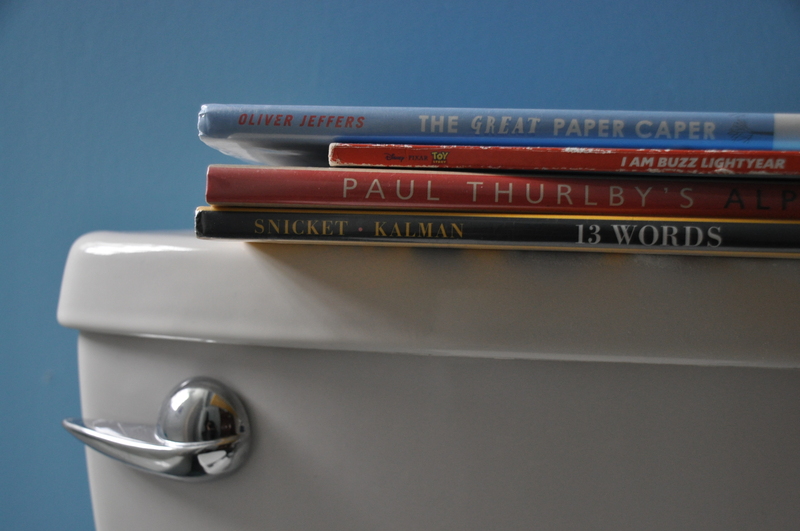 Would they guest write an edition of Picturebooks on the Potty?) She asked, “What does despondent mean?” And though I would ordinarily tell her to figure it out based on the context, I asked Cora to explain. “How do you feel if you are despondent?” I asked. She thought about it for a minute and amazed me by saying, “I fell sad mom,” with a cute long and pouty face to animate her point. Though perhaps I shouldn’t have been too surprised. She had agreed to play haberdashery (Word Number 9) with me during dress-up and sad she told me she was despondent (Word Number 2) when I said I was ready to stop. Any book that gets my 2 1/2 year old saying and defining multisyllabic words is good in my book. I felt the same about Goodnight Construction Site, which brought excavator into our lives. 13 Words also brought cake (Word Number 3) into the house, and whenever that happens you should be grateful. As Snickety suggests in the trailer for the book, few people refuse a piece of cake, even when it’s not that good. In this case it was good. After looking at Kalman’s drawings a few days in a row, Cora and I had to take a field trip to the bakery where she could look into the display and see the layers of cake a icing topped with fruit and marzipan. We brought home a few different slices and had our own little party, just like the bird (Word Number 1), dog (Word Number 4), goat (Word Number 7), and the mezzo-soprano (Word Number 13) in the book. Have you read any good picturebooks lately? Swing space. Perfect for Skype meetings with students, sewing, blogging, and crafting with the wee one. I had to move out of my office/studio this month. It was a sweet spot, lighted on three sides by a wall of windows, so I didn’t mind sharing it with the rest of the family’s sports equipment and muddy shoes. It was a room Dan and I re-imagined for me when I first moved in with him and the kids. I had been living and working alone and knew I would need a room of my own. During the dreary winter months, I bathed in its hazy glow – even when I had to wear two sweaters, a hat, and blanket. In the summer, I watched the birds fly around the garden as the crickets offered up a wall of ambient sound for me to work to. I’m moving out so we can make the space even more useable, so I’m hoping to be very happy in a couple of months. But for the time being, I need to find an alternate place to work. I’ve been floating around the house for about a month, but yesterday I started to clear a spot for myself in the basement. This got me thinking about how creativity can be fostered by changes like this. I can remember a classmate in college who painted on a large scale until she moved back home with her parents and had to paint in her childhood bedroom rather than the campus studios. Suddenly her work was super small, and incredibly interesting, particularly for the point of contrast it provided her old work. I’m hoping that being in a new environment will change my work, in ways I can’t yet imagine. I’m sure you’ll hear all about it. So, I’m starting to get organized for our Toddler Time experiments at the Columbus Museum of Art next month. I am drafting a note to the participating parents; to clarify dates, times and locations, to set some basic expectations and guidelines, and to offer some ideas from the literature in early childhood regarding social, physical, and cognitive development within creative exploration. I’m also starting to put together some “lesson” plans. 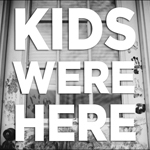 I will be documenting that planning here to share it with those parents as a form of preparation for our time together and as a space for questions, comments, and criticism. I’m also hoping I might get some feedback and recommendations from other folks who work with young children – in museums and other settings. Today, Cora and I pulled out a lightbox I had stored in the basement and a set of old colored plastic notebook dividers I had saved from one of the big kids’ end-of-the-school year clean-ups. If I were making a list of top ten tips for parents who want to encourage creativity at home, saving old things and finding new uses for them would be close to the top. This also fuels my interests in sustainability education, and I’m always really pleased when I find a good use for something I’ve been holding onto for a while, like these folders. (I frequently recommend Beautiful Stuff! 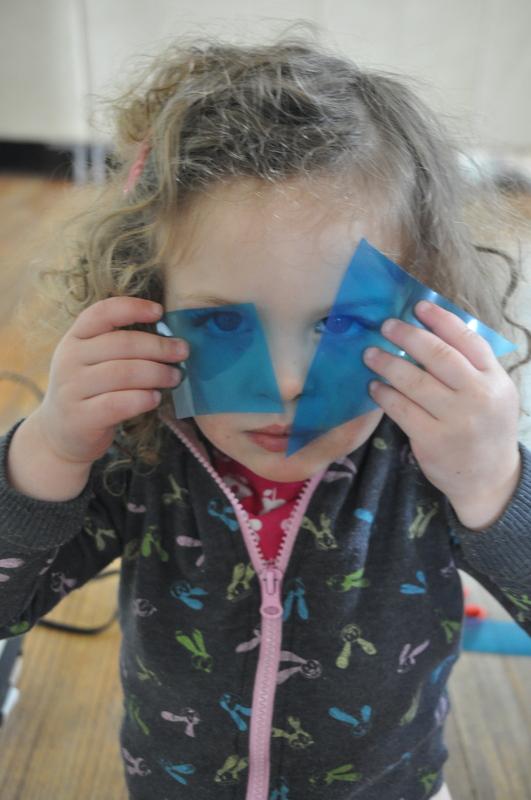 (Topal & Gandini, 1999) for more ideas about how to incorporate found objects into early childhood creative education.) Similarly, you don’t need a fancy box to do this kind of activity. DIY lightbox instructions are available all over the web. 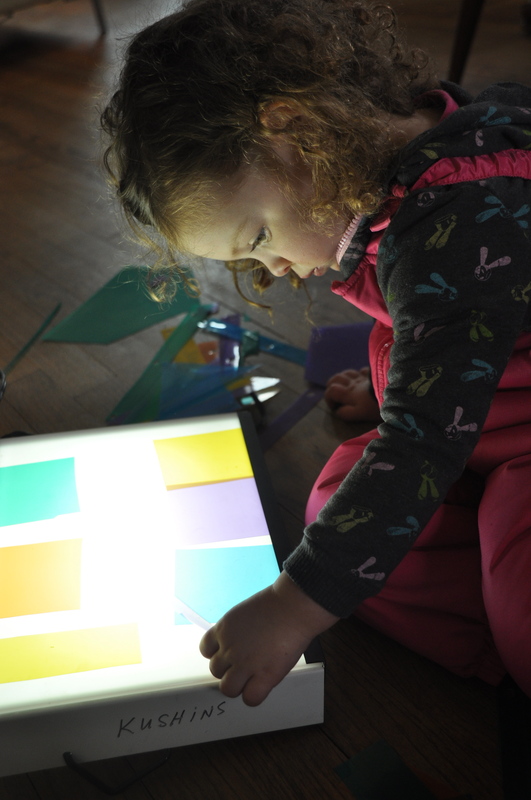 I started to cut basic shapes out of the plastic and Cora immediately took them and put them on the lightbox. She enjoyed placing them on the box and seeing them illuminate, overlapping them to make new colors, and starting to sort them based on their shapes and colors. She didn’t need any instruction. I plan to use this as one of the activities for the free play stations kids can explore during the first part of our time together. As she worked, I thought about Josef Albers’s (1963) Interaction of Color and the color aid paper experiments I conducted in my freshman design course in college. I also thought about Paul Klee’s geometric landscapes and Louise Nevelson’s assemblages. Oddly enough, the CMA is currently hosting a big show of Mark Rothko’s work to which one might also draw parallels with this activity. So far there aren’t any plans for designated time in the galleries each week as part of our playgroup, but perhaps I ought to reconsider that given this connection. It would be fun to look at Rothko with young children. Unless they’re like Olivia the Pig who couldn’t accept Pollock’s drip paintings, they ought to be more open to his work than many adults I know. The one thing I am a little worried about is that this activity will be very popular and my little lightbox won’t be big enough for everyone who wants to use it. We’ll just have to be prepared to talk about sharing and taking turns. Something tells me we’ll be doing a lot of that. Earlier this evening, I entered a URL into my browser and was transported to an auditorium in Gainesville at the University of Florida where internationally known artist Oliver Herring was giving a talk about his work. Visiting artists have been a staple of art school learning since the 1960s. It is an opportunity for graduate students, primarily, to hobnob with an art star, to hear from someone who’s made it really big, to be inspired by big ideas. * These artists also inspire art educators, and Herring had a lot to offer teachers given that his work often relies on collaboration with participants. In other words, like teaching, his are social projects. 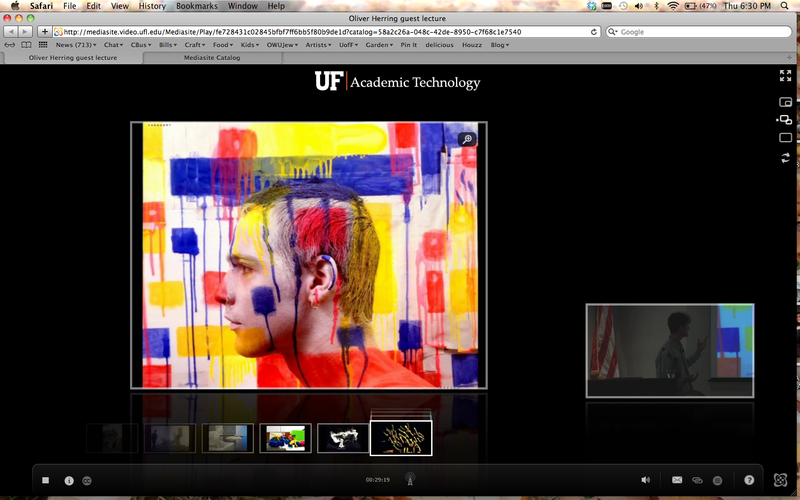 Oliver Herring at The University of Florida College of Fine Arts (3/14/2013). On the left, his slide presentation, on the right the video feed of him talking. If I had shared the link for this talk in advance, you could have been there with me. You can watch a recording of Herring’s talk, though I am not advocating this as the best way to learn about his work. For that, I’d recommend PBS’s Art21. Because, to be honest, the feed wasn’t that great. The sound started out just plain awful, though it improved dramatically once Herring respositioned his microphone (the result of a Twitter exchange between a few of us watching at home and our department chair in the audience). Herring also broke what I would consider a cardinal rule of public speaking in the age of Powerpoint and spoke for nearly half an hour before he showed a single image. During the Q&A I couldn’t hear the questions and he didn’t repeat them. What really amazed me about tonight, was that as I stood in my kitchen, listening to the talk, chopping vegetables, and sipping a glass of wine, I didn’t feel alone. I had a real sense of being alone together. I imagined my students in front of their own computers, listening in on the presentation. The feed was not password protected so anyone could have joined the audience, though I’m not sure you would feel a sense of belonging if you weren’t somehow affiliated with the UF arts community. But I could be wrong. In the future, perhaps universities will do more to advertise talks like these (I couldn’t find anything on the UF website), with online breakout chats for various interest groups to unpack what they heard in a semi-moderated discussion afterwards. That would be a redefinition of the artist talk worthy of a land grant institution in the 21st century. *For a thorough discussion on the role of visiting artists in artist education see Singerman’s Art Subjects: Making Artists in the American University, 1999. Accepting the truth: I am not a special snowflake. I was reminded of lori’s message as I read about Dipa Ma, a Buddhist teacher my sister Rebecca introduced me to a few years ago. I should say she tried to introduce me, since I didn’t have time to read the book she gave me 5 years ago about Dipa Ma’s life and teachings until last week. Again, I should say I didn’t make time. According to Dipa Ma, there is always enough time. I’m not interested in meditation, per se. But I am interested in making the most of the moments I find to complete the work that I want and need to get done done. I want to make the most of my time at work and with my family and friends. I want to enjoy my work. So, I’m going to read more of Dipa Ma’s teachings to see how I might become more appreciative of the pockets of time I find to work, rather than angry about the time I don’t have.